If your looking for the ultimate reliable high quality laptop then the refurbished IBM Thinkpad T61 is for you. Its suitable for home and office use and has excellent performance thanks to its INTEL CORE 2 DUO DUAL CORE T7200 core processor running at 1.8GHz x 2. So its fast enough for home/office and has both wired and WIFI internet connections. With its brilliant 14.1″ crisp and sharp display its a joy to work with. You have plenty of USB ports and also a card slot for PCMCIA cards. With digital imaging the norm these days , this item has a built in digital memory card reader. Weighing just 2.4Kgs this laptop is robust and well designed with the best components used. Costing £2200 new only a few ions ago , your getting a bargain at £219.99 with Windows 7 Home and the complete Microsoft OFFICE 2007 PROFESSIONAL installed. Built to last, as its still working now this laptop wont let you down on reliability or performance. Its got VGA out for monitor connection and comes fully cleaned and ready out of the box. Remember for your hard earned £239.99 your getting a windows 7 IBM laptop with Microsoft OFFICE 2007 PROFESSIONAL fully installed, 1 year warranty (excluding the battery, but battery in this laptop will hold a charge, cant guarantee how long though). So its a good deal and you wont be disappointed. This laptop represents excellent value for money and its better than buying any new cheap laptop for £400!. Please note this laptop is not new and will have slight marks, etc but this in no way effects the use and because we get these from blue chip ex lease companies the laptops are generally in very good condition. Versatility is a must with this laptop and it has both track stick and trackpad mouse input. Backed up with 1 year warranty, so its like buying new anyway. Item comes with CDRW/DVD-RW drive, 2GB of RAM and a minimum 80Gb hard-drive(big enough for most uses). Ideal reliable laptop for home office, students. etc. This item has no webcam. Posts related to IBM Thinkpad DUAL core T61 Laptop with Windows 7 Home Premium and COMPLETE Microsoft OFFICE 2007 PROFESSIONAL. With FREE upgrade to 320GB hard drive and 3GB of RAM while stocks last! 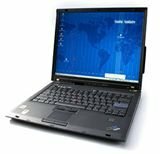 This entry was posted in Laptops And Tablets and tagged 2007, 320GB, COMPLETE, Core, Drive, Dual, Free, Hard, Home, Laptop, last, Microsoft, Office, Premium, Professional, Stocks, Thinkpad, UPGRADE, Windows by Computer Education World. Bookmark the permalink.